The Empire Strikes Back (or How Africa won Euro 2016 for Portugal) by Todd Cleveland In the 109th minute of the most important match of his career, Éderzito António Macedo Lopes, or simply “Éder,” rifled a low shot past French goalkeeper Hugo Lloris to place Portugal in a position to win the 2016 Euro Cup, an achievement the team would realize some ten minutes later. From my Lisbon apartment and, even more loudly outside my window, the raucous sounds of unbridled elation abruptly shattered the prevailing anxiety. Remarkably, though, given Portugal’s proud history in the sport, this victory garnered the country its first major footballing championship. Portugal finished third in the 1966 World Cup, led by the great Eusébio, and decades later the so-called “golden generation” of Portuguese players, Luís Figo most prominent among them, lost in the 2004 Euro Cup final in Lisbon, in heartbreaking fashion to a Greek side that played some of the most efficaciously painful football ever witnessed. I was living in Portugal at the time, and can confirm that the nation mourned, profoundly, at the final whistle and for some time thereafter. Essentially the same Portuguese squad finished fourth at the 2006 World Cup, but many of the talented players retired in subsequent years and the team consequently suffered, while still experiencing some success at the major tournaments. All of these squads, or selecções, as they’re known, featured African-born or African-descendant players from Portugal’s former colonies or now independent Lusophone African nations. Portugal was one of the first countries to utilize naturalized Africans in its national teams (second only to the French, whose use of such players has received significantly more attention), deploying these athletes in earnest beginning in the 1950s. In that decade, stars such as Matateu, Mário Wilson, and Hilário, each of whom hailed from Mozambique, began suiting up for the selecção; the legendary Eusébio would make his debut for the national team in 1961. Yet, despite the individual successes of these illustrious players and the numerous club titles they accumulated, they were never able to secure a trophy to parade through the streets of Lisbon. Indeed, only after Guinean-born Éder fired his historic shot did Portugal – as a multiracial squad and, arguably, nation – finally achieve this elusive objective. If Portugal was an unlikely champion, Éder was an even more unlikely hero. Born in Bissau, the capital city of the former Portuguese colony of Guiné (now the country of Guinea-Bissau), Éder relocated to Portugal as a child and eventually established himself as a solid player in Portugal’s first division, enjoying his best years with Braga. He’s currently contracted to French club Lille, following a poor spell at English side Swansea. But, at 28, he’s heading into the twilight of his career, at least as a striker. Yet, he played an instrumental role in doing what even the incomparable Eusébio was unable to achieve in his otherwise trophy-littered career. Éder, as a player with African roots on this iteration of the selecção, was certainly not alone. Arguably, 18-year-old Renato Sanches, who was named the Euro 2016 “Young Player of the Tournament,” made the most important contributions. The son of a Cape Verdean mother and Sãotoméan father, Sanches’ performance during Portugal’s 1-0 extra-time victory against Croatia earned him the Man of the Match award, while also helping to propel the squad through the ensuing knock-out rounds. In fact, Sanches’ talent and potential have already prompted German heavyweight, Bayern Munich, to pay his former club, Lisbon-based Benfica, a record transfer fee to lure him to Bavaria. Meanwhile, Angolan-born William Carvalho was also a steady presence in Portugal’s championship side. As a defensive midfielder, he played a key role in anchoring a very stingy Portuguese defense, which, remarkably, yielded only a solitary goal during its four knock-out stage matches. Constantly rumored to be a primary target of the major Premiere League clubs, Carvalho may well be ready to take the next step in his career, but for now he remains a rock in the middle of Lisbon-based Sporting’s midfield. Cape Verde-born Nani was also vital to the success of the selecção. Playing as a forward on a squad with only modest attacking ambitions, Nani still managed to score three times (Portugal scored only nine goals in seven games, with three of these strikes coming in an exciting draw against Hungary). And, perhaps, most importantly, once Portugal’s biggest star, Cristiano Ronaldo, left the final against France after only 25 minutes, Nani held the ball up well and interacted nicely with substitute Ricardo Quaresma, generating what little in the way of attacking football the squad could muster. João Mário, also of African descent, was seemingly everywhere during the tournament, though his performances could often be characterized by endeavor rather than results. Danilo, born in Guinea-Bissau, and Eliseu, whose mother is Cape Verdean, also logged important minutes at the tournament. 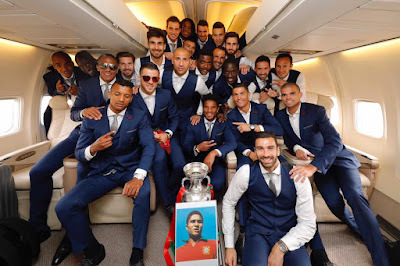 Although this collection of players will certainly not be the most celebrated in Portugal’s more-than-60-year tradition of picking players of African descent, this group, which featured both direct and indirect connections to the former colonial empire, did strike. And when it mattered most: in the 109th minute of the final. The empire had finally struck for Portugal in a way that no previous generation of African footballers had in tournaments of this magnitude. 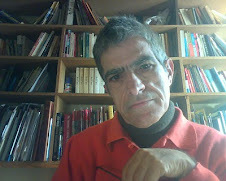 Indeed, in this manner, and in many other ways, the empire endures – much to the chagrin of the French squad and the more than 65 million French citizens who were hoping to avoid the fate of Portugal’s 2004 Euro Cup squad, which similarly lost 1-0 in the final match, as the host nation, and by an identical 1-0 score line. If only the 2016 Euro Cup final had been in Athens. Fittingly, on their flight back from France to Lisbon, the Portuguese selecção posed for a group photograph. Huddled around the prized Euro Cup, a photograph of Eusébio was propped up next to it. Finally.